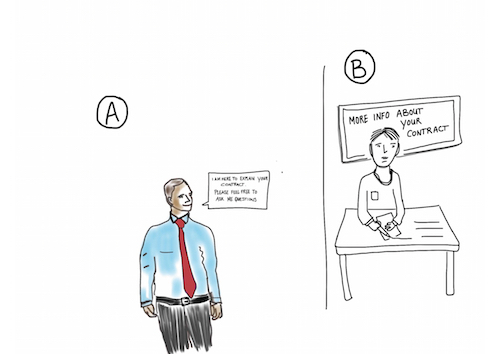 The founder of Creative Contracts, Robert de Rooy, shares his story on how he developed and created the world’s first Comic Contract. The development of comic contracts started long before I thought of Comic Contracts. Louis M Brown, who started the Preventative Law movement back in 1954, advocating the idea that the better role for lawyers is to keep people out of trouble. Prof Thomas Barton, who held the Chair in Preventative Law at the California Western School of Law, and who always offers thoughtful and eloquent observations in print and in person on the law and contracts. Stewart Levine, whose book, The Book of Agreement, was an eye opener on how contracts can be written up to be a heartfelt commitment. Prof Colette Brunschwig, who has long advocated the concept of Visual Law and using visualisation to improve communication of law and in law. Prof Helena Haapio, who developed the concept of Proactive Contracting, which sees contracts as a strategic tool to improve business outcomes, and who, together with, inter alia, Prof Thomas Barton, Prof Gerlinde Berger-Walliser, Prof George Seidel and Dr Stefania Passera, have for many years advocated and illustrated the idea of using visualisation in contracts to this end. Kim J Wright, the American Bar Association’s “Legal Rebel”, who tirelessly travels the world connecting “Integrative lawyers”, and authors books keeping everyone informed of what is happening. Stewart Levine, whose book, The Book of Agreement, was an eye opener of how contracts can be written up to be a heartfelt commitment. It struck that while using pictures in contracts will make them more understandable, it would be unfair on low literate people who would rely on the pictures that are easy to understand, but legally bound by the text that they don’t understand! 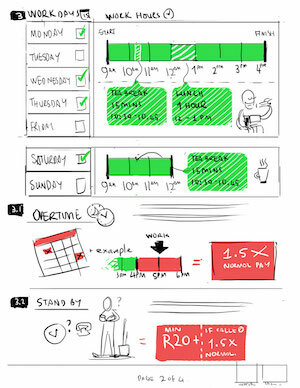 I started to wonder if I could create a contract using only pictures, and then one morning I thought of comics (where else but under a shower, but long before the water restrictions in Cape Town), and thought: If a comic could tell a story in pictures, and a contract is a dialogue about a future relationship, maybe a contract can be expressed as a comic…? I shared my idea with my neighbour, Oliver Power, who had a background in comics. 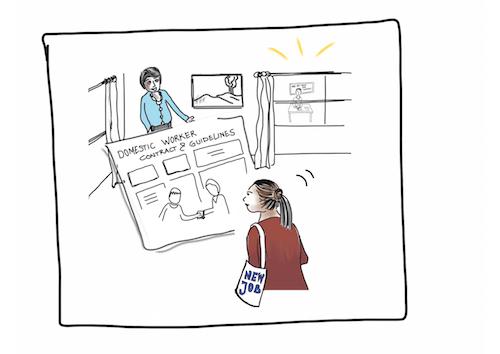 Alex Kramer spontaneously drew the first pages of a comic contract for domestic workers. 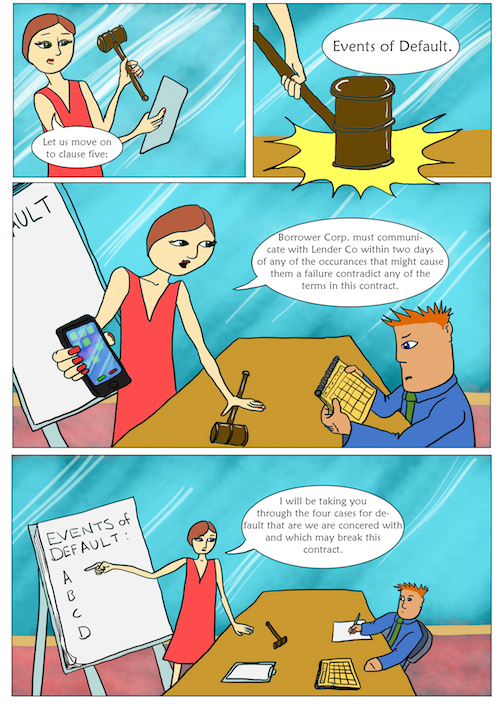 In September 2014, I hired a cartoonist, Chip Snaddon, who produced some beautiful examples of contract clauses. He showed me how comics could express respect and dignity by the faces of the characters and by positioning them at equal height, and I became re-inspired. But progress was still slow, and we did not cover many new clauses. I was concerned about the comic contracts becoming “Talking Heads” i.e. too much text in the call out boxes. It was not true to my purpose to create a contract that could be understood by people that cannot read. I thought that if I could find a lawyer that was also an artist, it would be easier to complete a comic contract. I contacted Susanne Hoogwater in Colorado, USA, and I explained my ideas to her and together we worked through ideas for the various clauses of a domestic worker agreement. 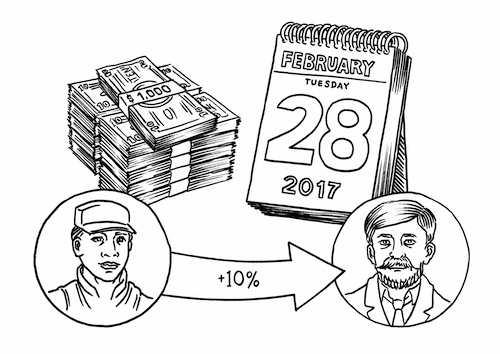 At the same time, I worked with Nathan Pozarycki to draw a complete loan agreement. He did great work, and I really liked the flair he added to the comics. I also worked with a German artist, Felix Pestemer, who was introduced to me by a mutual friend, and who was willing to take up the challenge of drawing a loan agreement without a single word. In October 2015 I was invited to speak on Comic Contracts at a Restorative Justice Conference hosted by UNISA in Pretoria. Following my presentation Kim Wright, who had recommended me to the organisers, offered to introduce me to Helena Haapio. Helena also recommended me to the organisers of the Swiss Re Contract Simplification Conference in Zurich in April 2016. 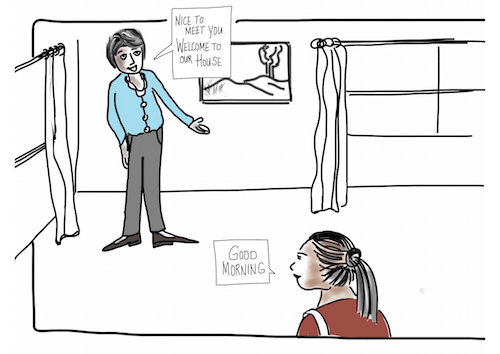 After I was confirmed to present Comic Contracts at the conference I knew that this was my biggest and best chance to share the idea of comic contracts to help vulnerable people understand contracts. I also wanted to give a presentation that was worthy of the unique platform that Swiss Re was offering me. I had recently been re-introduced to Andrew Smith, whose company Jincom EHS, produce illustrated health and safety guidelines for international utilities and mines. Having experienced their passion, professional processes and quality work, I was keen to partner with them. I approached a client of my legal practice, Clemengold, to give me the budget to try and create a completed comic contract to present at the conference. Clemengold is the consumer brand of a large South African citrus farming business, ANB Investments. The CEO of ANB Investments, Abs van Rooyen, offered his full support and agreed to help produce the first Comic Contract for their fruit pickers. Working with the Jincom team, we were able to produce a professional quality Comic Contract in under 3 weeks, which was subsequently signed by 300 workers. 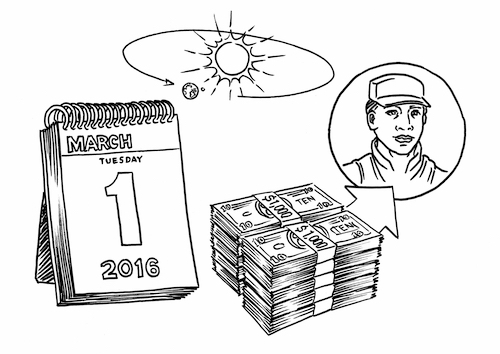 This enabled me to present the world’s first comic contract at Swiss Re’s Contract Simplification Conference in Zurich in April 2016. Following the presentation, I was invited by Sally Hughes and Tim Cummins of the IACCM to present the idea of Comic Contracts at their America’s conference in San Diego in October 2016, where Comic Contracts was also awarded the Program of Visionary Change – Innovation Award. 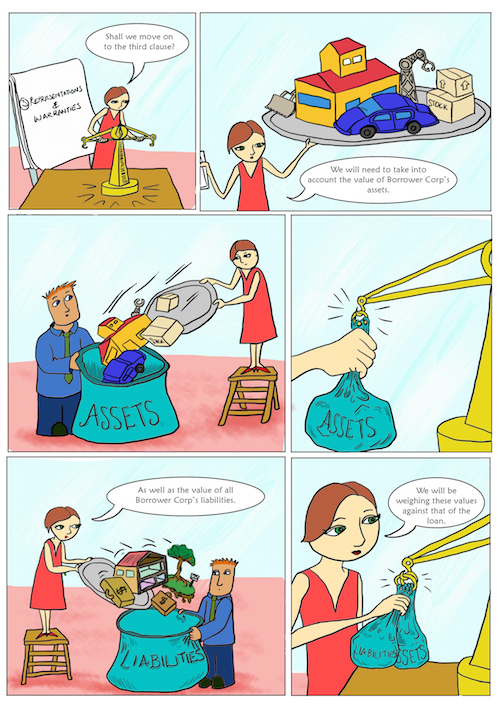 In the meantime, and completely independently of the work I had been doing, Prof Camilla Baasch Andersen, a law professor at the University of Western Australia started working on a project with UWA’s engineering department to use a comic strip to explain a non-disclosure agreement. 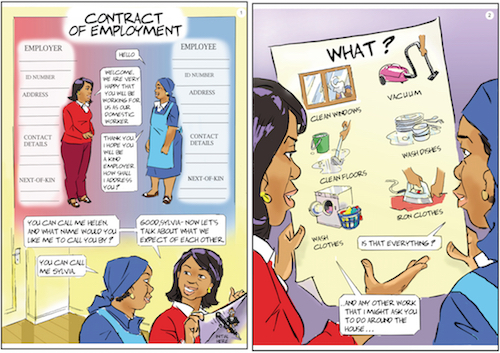 Based on this work, Aurecon, an international engineering consulting firm, worked with Prof Andersen to produce an employment contract in a comic book format for new employees in their organisation. Their work showed that the potential for comic contracts is not limited to low literacy people, but can benefit the relationship where the parties are highly literate. Prof Andersen and the University of Western Australia hosted the first comic contract conference in Perth in November 2017, bringing together lawyers, academics and illustrators to share ideas. 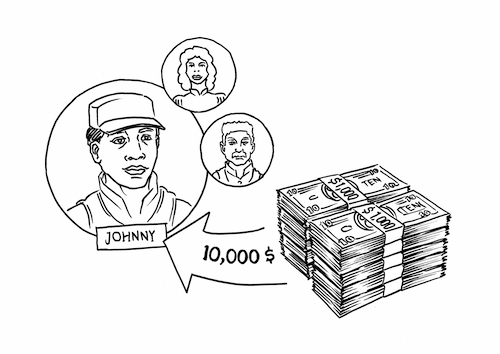 The purpose of Comic Contracts is to help everyone understand the contracts they must sign to improve contractual relationships and outcomes. At the same time, no one should be subjected to the indignity of having to sign a contract that they cannot reasonably be expected to read or understand. The best way to achieve this purpose is by sharing our ideas on making better contracts. I welcome anyone who wants to try creating their own comic contracts. Feel free to reach out to us, and we will share with you what we know. I only ask that the copyright in the work that we produced be respected. 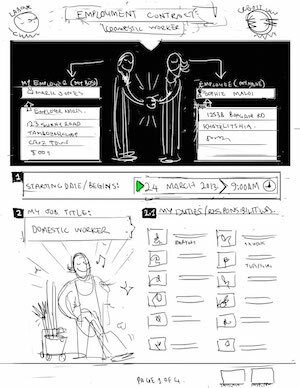 The more lawyers and illustrators and legal and information designers work together to make contracts understandable for everyone, the more vulnerable people we will reach, and the more meaningful will be the difference we can make. I especially hope that lawyers in the more marginalised societies and languages, so often the most vulnerable and exposed to abuse in our world’s market economy, will try to tailor this idea within their own communities. In the meantime, we want to continue to develop and improve Comic Contracts, to expand the categories of Comic Contracts and create more examples. It’s such a visual concept, and as I experienced when I saw Alex’s first draft, you only really believe it when you see it, and if we want to make a difference to a lot of people’s lives, we need a lot of believers. Finally, there are some people not mentioned above that I also want to acknowledge for their contributions, without which, we wouldn’t be where we are now. Prof Tom Ryan for introducing me to Systems Thinking. It liberated me from my ill-fated dream of becoming a professional full time mediator when I realised that every dispute is an agreement gone wrong, and that I can make a much bigger difference by improving agreements than hoping for appointments to pick up the pieces of disputes. Luc Hoebeke, a Systems Thinking maverick, who have me the insight that I should never strive to serve the parties to a contract but the relationship between them. Amanda Boardman, for organising the first Integrative Law Conference in South Africa, where I also met Kim Wright. Dr Marietjie Botes, who’s work on illustrated explainers for San people to give a more informed consent for genetic testing was inspirational. Cobus Joubert, for re-introducing me to Andrew Smith. My wife, Cecile Feront, for indulging my idea to do something that can make a meaningful difference to the lives of those that are being left behind. Luc Hoebeke, a Systems Thinking maverick, who gave me the insight that I should never strive to serve the parties to a contract but the relationship between them. Michael Edmunds and Theo Barnard, for always providing me with sound legal advice. Marietjie Botes, whose work on illustrated explainers for San people to give a more informed consent for genetic testing was inspirational. Our friend, Cobus Joubert, for re-introducing me to Andrew Smith.